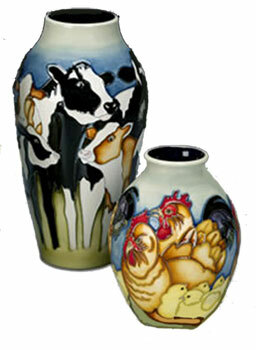 Moorcroft Fowlers Farmyard Chicken Discounts Apply ! Kerry designed this piece to compliment the very succesful Fowlers Patch.Here is a collection of animals down on Fowlers Farm. 5 pieces with a common theme and backgrounds sheep, pigs, geese, cows, chickens. This piece shows the Chickens with there chicks in a field of green against a blue sky. they shine from the vase with the oranges and reds of the chickens and the yellows of the chicks.